Acting as a home to the Ayurvedic treatment which uses natural herbs together with natural cures, Gujarat promotes healing through Ayurvedic. There are plenty of world class hospitals in some of the main cities of Gujarat like Vadodra, Karamsad, Nadiad, and Ahmadabad which offer significant treatments to the patients that come from different corners of the world. Gujarat also has eminent presence of pharmacies and colleges which are recognized all over the state. Myriad of spas are located in Ahmedabad, Mehsana and Gandhinagar, which excel in offering impeccable treatments for healing and rejuvenating your sickness. Gujarat is well known for its Yoga centers throughout the state. This ancient art that belongs to Hindu philosophy prescribes the physical and mental fitness for body, soul, and mind together with the spiritual being. This allures the tourists from different corners of the world who come here and experience this state of the art medical technique. Lying of the west coast of India, Gujarat is a home to Ayurveda since many centuries. Most of the herbs which are used for curing illness by the means of healing process are seeded and grown in this state. The sufficient agro-bio diversity contributes to the growth of 786 herbs which are also called medicinal plants. Of all these, some well known ones include – Shatavari, Sonamukhi, Sankhapushpi, White Musli, Neem, Jeevanti, Isabghol, Aloe Vera and Asawagandha. Gujarat is mainly vegetarian and dry state while people prefer having Jain food only. The natives are used to embracing the Indian system of medicine which includes Naturopathy and Ayurveda. The rich people have established many health resorts in Gujarat, while on the other hand the government of Gujarat gives significance to the Indian system of medicine and Ayurveda. Ayurveda is known as an ancient medical science which has handed down since ages. It is basically a system of medicine which is very popular in India which dates back to 5 millenniums while its therapeutic values are now being realized all over the world. Ayurveda gives attention to the elimination of illness by means of a holistic approach for curing diseases. Ayurveda also aims in maintaining a perfect balance between the body, soul, and mind. In this present era of busy life and stress, Ayurveda is now viewed as a remedy for all these ills. Ayurveda medicines utilize minerals; natural herbs together with some gems for curing the diseases while promote immunity. There are no harsh or brutal experiments performed on animals in the lab. Jamnagar which is a port town in the region of Saurashtra is a prominent place for studying Ayurveda in India. Speaking in other terms, it has the best university which is dedicated for studying The Science of Life and Ayurveda. This university has sufficient facilities for the graduates and post graduate degree, certificate programs and diploma. Different courses offered by the university include – Ayurvedic Pharmaceutical Sciences, Medicinal Plant Sciences, Naturopathy, Yoga, Ksharasutra, Panchakarma, Self Health Care, Surgery, and Ayurvedic Sceinces. Founded by Jadeja Rajput in 1540, Jamnagar was ruled by the rulers of Nawanagar. The place enjoys an assortment of distinctions for example for being a vital seat of oriental studies, prominent button and brass industries, a naval base together with the tie and dye fabrics which are called bandhani and pearl fisheries. Presently this region is much popular for Ayurvedic University. Jamnagar prides of the Ayurvedic physicians like Rasa Vaidya Bavabhai Achalji and Zandu Bhattji. The rulers of this state patronized this medical science since many years ago. Jamnagar has an Auryeda University, which has a sprawling campus, an institute for naturopathy and yoga, the Maharish Atreya AIDS and Cancer Research Center, an international center for Ayurvedic studies, an institute for medicinal plant sciences and an institute for Post Graduate Teaching and Research in Ayurveda. The University has played an important role in cultivating Sarpagandha. This was done for the first time in Gujarat in the year 1954. Since that year, more than 200 species of herbs and medicinal plants have been grown in the university gardens. The PG institute of this University is known as collaborative center of WHO since the year 1977, Most of the fellows from countries like Myanmar, Thailand, Bhutan, Bangladesh, Sri Lanka, and Nepal visit this university and receive training in assorted Ayurveda specialties. The university is presently paying attention on motivating Ayurveda in foreign countries also. It admits many foreign nations to its different courses. The university has associated links with most of the associations and institutions abroad. Below the aegis of this university, well equipped drug standardization has been established for drawing up internationally accepted standards for the Ayurvedic drugs. A tissue culture laboratory and a green house have been set up for cultivating the medicinal plants particularly those which are very rare while grow only at high altitudes. Jamnagar presently is well known all across the globe for being world’s largest single stream crude oil refinery which provides easy accessibility to the refined petroleum products for helping the wheels industry. However it is also acknowledged for its way for carving a niche for itself as one the celebrated global centers for alternative and complementary medicine in the form of Ayurveda. Gujarat that is doing impeccably well in the medical tourism has sufficient potential for Ayruveda-based medical tourism. This mission is working excellently well for developing Ayurvedic medicine in India. 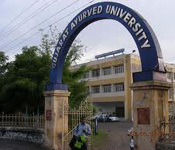 Gujarat is the only first state in country India which has started the Ayurvedic University. It is now right time to discover other possibilities for developing and popularizing Ayurveda. The treatment of Panchkarma is gaining immense popularity in India specially Gujarat. So most of the people from foreign countries come here and seek relief for their illness through this treatment. The state has developed such policy that increases the Ayurveda tourism in Gujarat. Ayurveda is now enjoying a revamp in India and teaching new methods in the university, which includes the Gujarat Ayurveda University. Further it also lays stress on the western standards and yogic aspects of Ayurveda.